I do not wake up in the morning thinking to myself that I have a biracial child. I don't tickle her and think about the color of her skin or the texture of her hair. I don't do these things anymore than I kiss my husband in the morning and think to myself that he is black. These people are my family, my world, and the motivation behind just about everything I do. It's not that I'm "colorblind" (a term that only those blind to their own privilege can use with any sincerity). I am aware of both racial inequality and my own privilege as a white person in America, and I try very hard to check that privilege in ways that make me more productive in creating an equitable world. So I'll never tell you that I "don't see" race, but I certainly don't make it the end-all, be-all of my observations about someone, and I certainly don't put racial identity at the forefront of my interactions with my own family. We are a family. The fact that we are a multiracial family really doesn't have much bearing on my day-to-day life. That's all very nice to say (and I mean it), but I also live in St. Louis, Missouri, one of the most segregated cities in America. (Check out this BBC mini-documentary about Delmar Street, the street that divides one of the most segregated portions of one of the most segregated cities.) That means that families like ours aren't all that common here. I'm not exactly living in a valley of tolerance and love, is what I'm trying to say. Perhaps this is why my students always seem surprised to learn that my family is multiracial. First, some background. I teach at a community college, and the student body is mostly made up of racial minorities. This is even more true of the students in my classrooms, as I teach developmental writing. Over the course of the semester, my students and I get to know one another. I require them to come to my office to talk about their papers, and I have a picture of my daughter on my desk. Their reactions are always interesting to me, and there almost always are reactions. This semester, I've gotten several versions of "I didn't know your daughter was mixed!" (Of course you didn't. I don't walk into the classroom and announce "Hi! I'm your teacher. 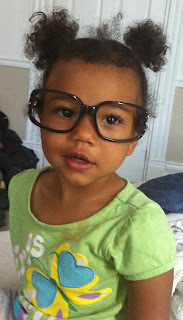 My daughter is biracial.") Usually they make that statement, tell me how cute she is, tell me about their own kids, and then we move on to their papers. There have been a few variations on this conversation this semester. "Your daughter's mixed?! I could tell you had too much soul." "Is that your daughter? She's so cute! Is she mixed? I knew that you . . . How do I say this? I could tell that you were cool with everyone." I will say that I haven't gotten any reactions from my students that came across as negative. There has been genuine surprise, and there has been the suggestion that my daughter's picture somehow affirms something they suspected about me, but the reactions are almost always positive. What does this mean? Does it mean anything at all? I know that race matters, and I know that race factors into how I teach (especially when it comes to how I talk about grammar). While I don't think that being part of a multiracial family makes me any less racially privileged, it has made me more aware of that privilege and how unjust it is. I hope that positively impacts the way I interact with my students as well. I'm a white Australian and my daughter is an Aboriginal Australian. But you wouldn't know that by looking at her - she has fair skin and blue eyes. It is always interesting to note people's responses when I mention that she is Aboriginal or when asked by a bureaucrat whether she is Aboriginal or Torres Strait Islander (a standard question on govt forms here) and I say she is and I see them looking at her (if she is there) thinking 'well she doesn't look like she is!'. It is also interesting to me how I am generally accepted more readily into local (Aboriginal) community events/places when it is know that I am married to my husband (who is Aboriginal). The welcome is generally warmer, or feels that way, when it is realised I am part of community (via my marriage) than just being a white person tagging along. It's SUPER interesting that they "thought they could tell" - that's a weird form of stereotyping but I know what they mean. I sometimes assume people are or are not homophobic, which can be an unfair assumption either way. But the idea that they thought you had "too much soul" is a really interesting comment. What that implies about white people who are not married to a different race fascinates me. And that "you are cool with everyone" comment is also totally interesting in that you might be totally homophobic or racist against Hispanics or something else, but that your daughter is mixed implies you are accepting of all. Probably the way you teach and present yourself would rule out those other theories, but I find it fascinating that showing a picture of your daughter implies so much! I tend to make assumptions that people are not racist/homophobic/sexist, etc. and then get really disappointed when I find out otherwise. I still keep making those assumptions, though. That might make me naive, or it might be a sign of my privilege that I can make that assumption about people in the first place. I think the thing that shocks me the most with my students' reactions to her picture is that they often reveal to me that their default was NOT to assume that I was not a racist. (And yes, I agree that the picture in no way proves that I'm not, but I hope that I prove that I'm not in other ways.) It makes me both sad and more aware of my students' (of all races) position when I find out that many of them won't (or can't) assume that people are accepting of them. Sad that I am not suprised by your students responses. My husband is black and I am white we have a daughter together. At work I also get the suprised comments such as "I knew you had some soul in you" I even had a lady who didn't like me spread the rumor that I was a racist- it was amusing to watch it backfire on her when she was informed by other minority staff that my family is multiracial! It is unfortunate that race plays such a big part in others opinions of us. I, like you, don't often think of it at all when home with my family. Its not until we step outside of our home that we are forced to see what so many others see. Yes. Stepping outside definitely makes me see things differently. Most of my students, though, seem genuinely surprised, and I don't take offense at their comments (whereas I have had comments from strangers that I DO take offense to). I just find it curious that they seem to think knowing my family is multiracial means something about me as a person, when it really probably doesn't. I am actually the product of an interracial marriage, and I have to say that when I was a child attending a private school in a small/medium sized town(in the 1980s), I felt really isolated from my peers because I wasn't completely white (I'm Caucasian and Asian, btw). I was never Asian enough to hang out with the Asian kids, and I was never "white" enough to hang out with the other Caucasian kids. I guess it's a good thing that most Asian households have extremely close-knit families, and so there were always lots of cousins to play with. It wasn't until I was in college in San Francisco that I felt like people didn't notice (or didn't care) about the color of my skin & I was finally able to come out of my shell. I think that it's a lot easier for kids today who are biracial because it seems more common, and I certainly hope that people can get past the color of a person's skin as a defining quality. I'm sorry to hear that your experience was so isolating. We think a lot about that as we choose where we're going to live/send our daughter to school. I think you're right that it's easier for biracial kids than it used to be, and I am very hopeful that that means we are moving toward a time where people can truly not use skin color to define people. I have four biracial (black and white) children (but am no longer married to their father)...and it's hard to explain to people that black people still are discriminated against, still are treated differently, and continue to experience a different American experience than white people do. My kids are considered "black," kinda like Barack Obama...rather than biracial or "half black." If you exhibit color, you are seen as that, plain and simple. And it changes everything. Those who think that everything's peachy keen, that the "race card" is just some game played to get an advantage, is way, way off. However, as their white mother, it's quite odd (and more than a little disconcerting) to have such an intimate perspective of racial issues. I can go out by myself and I know exactly how I'll be treated everywhere I go. I know that I have white privilege. At the same time, I also know my kids don't. It's a pretty unique situation, seeing and knowing firsthand that my own children get treated differently if they go into a store or mall or just walk down the street. I don't know how my kids feel about that, because we've actually never spoken about how they don't get the same automatic "privilege" that I do simply based on my appearance. We do discuss racial issues, and they're pretty in touch with them, but don't dwell on them. It's life. Sure, we're not dealing with the '50s or '60s mentalities anymore, but this country is far from being colorblind. Btw, I have heard those comments quite a few times, once people see my kids, or see pictures of my kids. "Wow, so your kids are biracial...I would have never guessed!" is usually the kind of sentiment I hear. Why would you GUESS that? Should I be wearing certain earrings or a doing a special handshake or something, to let people know? I should say that when I see people's children that are not multi-racial/bi-racial. That would be great...seeing pictures on someone's desk and going, "I didn't know your kids were _____...wow!" I'd love to see the reaction. It's also interesting that your students perceive you as one thing (white - with all the connotations) until they know that you're wife and mother to non-whites. I think you are giving an acceptability to other about interracial dating, especially that area. I really loved a black boy in high school (I'm white) but it was a taboo and act of rebellion to date outside of your race there (in Louisiana in 1993!). People at school new about our friendship and called my house to tell my mom I was a "n-gg-rlover". It was bad there but I wanted to put all races in my dating rotation. I was and am still very attracted to darker skinned men. I moved to Hawaii and freely dated various races. You are taking away the social stigma of interracial dating there so embrace that opportunity. They are just a bit ignorant and if you are happy they will see normalcy and family. Your family is beautiful! I did marry a hispanic man so my son is mixed. We identify him as hispanic because looks it more that caucasian and frankly schools here in L.A. ask 1st about ANY hispanic heritage before any others. It's weird! Great piece but far too much "white woman hangs her head and follows the anti-racist script" in it to say anything enduring and helpful. Not ALL whites have privilege-that's purely synthetic politics. What isn't is the fact that your child may face racism and stupid comments from Black identifying multi-racial people and one drop obsessive catty Blacks just as often as she may face it from whites. Hopefully this will not occur, but if it does ideally you will not blame the historical injustices their ancestors may have suffered for their so called "internalized racism or lack of privilege" or you will do anti-racism (true anti-racism, not the tired academic script) and your daughter a true disservice. In short you asked:"What does this mean? Does it mean anything at all?" It means something much more to Blacks and the majority of white liberals in THIS era that your daughter only BE Black and while "mixed" may be used on your end or there's, you are expected to uphold the white supremacist one drop. That's what it means. If I am "expected to uphold the white supremacist one drop," I assure you that I do not. I don't believe in race as anything other than a social construct, but I believe that social constructs have an impact on how we live our lives. You say "not ALL whites have privilege," but they do. They (we) all have racial privilege, at least in my (American) culture. That does not mean they are not the unprivileged in different binaries. Perhaps they are gay and then on the unprivileged side of the gay/straight binary. Perhaps they are disabled and then on the unprivileged side of the abled/disabled binary. But if they are white and perceived as white, then they all have racial privilege. You say that's "synthetic politics," and I guess I agree to the extent that I think race is a "synthetic" construction. It's not biological; it's social. But we live in a social world, so that still matters.